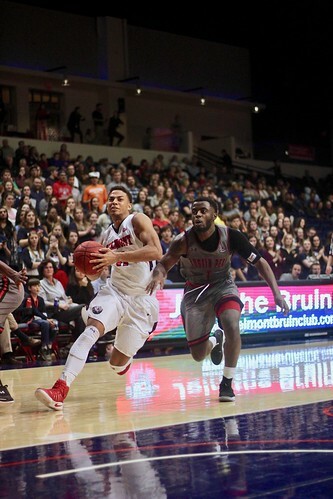 The Belmont men’s basketball team (15-6) destroyed interstate conference rival Austin Peay 83-59 Saturday night at the Curb Event Center. Junior Dylan Windler scored a career high, with an unprecedented 31 points and seven three-pointers, completing the Bruins’ sweep of Saturday’s doubleheader. The Bruins, coming off a solid win on Thursday against Murray State, came into Saturday’s game with enough momentum to grab another conference win against the Governors (10-10). The game started off relatively flat for both teams, as each struggled to complete shots and avoid fouls. Things picked up when senior Amanze Egekeze hit a go-ahead three, which sparked the Bruins’ dominance for the rest of the game. and a three-point percentage of 50. But even with a 24-point win and a record-setting night for Windler, the game’s biggest highlight arguably came from student Turner Brown hitting the rarely-made shot for tuition at halftime. With Saturday’s win, the Bruins improve to 7-1 in conference play. The team will take a four-day break before facing Southern Illinois Thursday night at 5 p.m. in the Curb Event Center. Article written by Steven Boero. Photos by Carina Eudy, Zach Gilchriest and Liz Gresser.